Built with the best features from Contour's previous models, the Contour +2 is a stellar action camera and Contour's best to date. The Contour +2 exchanges some features for others, but ultimately combines the best of Contour's cameras in a single gorgeous package. The Contour +2 follows Contour's trademark style, featuring a brushed metal case and a built-in handle that doubles as a mount point. The camera weighs in just a hair heavier than the Contour ROAM 2 at 5.5 ounces, although the size of the camera is essentially unchanged. 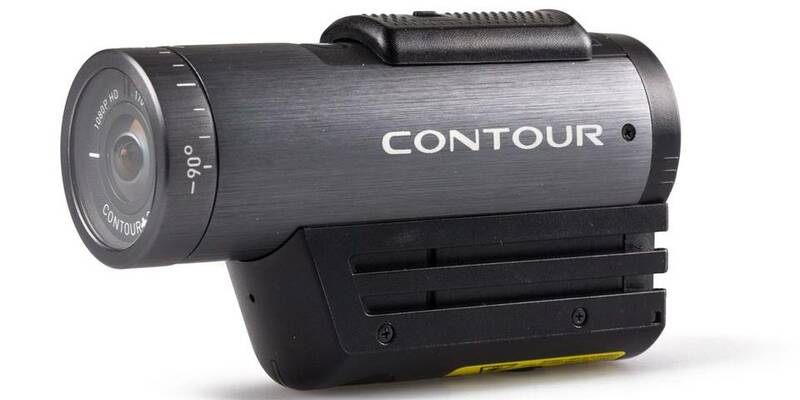 The +2 brings back some of the familiar features of Contour's older models, while adding some small but welcome tweaks. Making a comeback is the recording switch at the top of the camera, allowing you to instantly begin recording photos or videos by moving the switch forward. A locking mechanism prevents the switch from toggling when you don't want it to. Behind the sliding door on the back of the camera are the familiar microSD and mini USB slots, along with buttons for resetting the camera and formatting the SD card. The +2 introduces an HDMI-out port for streaming video to a TV or monitor, as well as a removable battery. Additionally, the bottom of the camera features a new port for attaching external microphones. The +2's internals include a GPS receiver and a Bluetooth module. With GPS enabled, the +2 embeds GPS data - speed, elevation, distance, and location - directly into the video. With Bluetooth enabled, you can use your smartphone or tablet as a viewfinder. Although the +2 does include a laser for alignment, the remote viewfinder is a huge step up from Contour's earlier camera models. A minor disappointment of the +2 is that it makes little strides in its video features It's still limited to 30 frames per second (fps) at 1080p, which doesn't cut it when competitors support the same frame rate at nearly 4x the resolution. The +2 also supports 960p or "Tall HD" at 30fps, 1280x720 or "Action HD" at 30fps or 60fps, and 854x480 at up to 120fps. The wide angle lens is capable of taking shots with a field of view (FOV) of up to 170°, and can be rotated up to 270° to account for sideways or upside-down placement. What the +2 lacks in frame rate and resolution it makes up for in quality: the +2's camera can take sharp, vivid images in most lighting conditions. The camera is somewhat sensitive to heavy vibration, so you'll want to use a mount of some kind. The +2 is capable of taking 5mp photos at a resolution of 2592x1944. It can be set to automatically take pictures at intervals of 1, 3, 5, 10, 15, 20, 30, 45, or 60 seconds. The +2 introduces some amazing new features in exchange for others. Unlike the ROAM series the +2 itself isn't waterproof, although it does come with a waterproof case rated for 60 metres. The battery life isn't quite as long as the ROAM 2, although the ability swap batteries makes it easier to plan out a shoot. The lack of Wi-Fi is apparent when coming from other competitors, although the addition of Bluetooth strengthens Contour's position as a serious contender. The +2 can make use of Contour's wide array of available mounts to attach to almost anything. With the +2, Contour's added some much-needed features while retaining the ease and accessibility of their older models. Some of the changes - particularly the removable battery and real-time viewfinding - will help solidify the +2 as a contender in the action camera industry. The lightweight brushed aluminum body, ultra-wide lens, and HDMI port help showcase the +2 as a premium option.